The Indians discovering Lewis and Clark by Charles Marion Russell. Wikimedia. The Lewis and Clark Expedition came in contact with nearly fifty Native American tribes and soon learned that the various groups had different lifestyles, languages, and opinions of the white men. Some welcomed the explorers and were eager to trade and interact; others acted fearful or threatened. 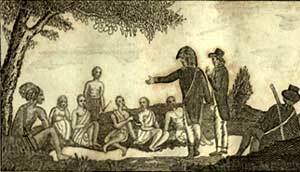 Jefferson had instructed the Corps of Discovery to befriend the Indians, develop trade relations, and collect military and scientific information. Captains Lewis and Clark Holding a Council with the Indians by Patrick Gass. Courtesy of The Albert and Shirley Small Special Collections Library, University of Virginia Library. … those two cures has raised my reputation and given those nativs an exolted oppinion of my skill as a phi[si]cian. 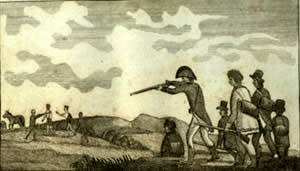 Captain Lewis Shooting an Indian by Patrick Gass. Courtesy of The Albert and Shirley Small Special Collections Library, University of Virginia Library. I called to them … that I would shoot them if they did not give me my horse and raised my gun, one of them jumped behind a rock and spoke to the other who turned around and stoped at the distance of 30 steps from me and I shot him through the belly, he fell to his knees and on his wright elbow from which position he partly raised himself up and fired at me, and turning himself about crawled in behind a rock which was a few feet from him. What are the acute diseases of the Indians? Is the bilious fever attended with a black vomit. Is Goiture, apoplexy, palsy, Epilepsy, madness…ven. Disease known among them? What is their state of life as to longevity? At what age do the women begin and cease to menstruate? At what age do they marry? How long do they suckle the Children? What is the provision of their Childrn. after being weaned? The state of the pulse as to frequency in the morning, at noon & at night — before & after eating? What is its state in childhood. Adult life, & old age? The number of strokes counted by the quarter of a minute by glass, and multiplied by four will give its frequency in a minute. Are artificial discharges of blood ever used among them? In what manner do they induce sweating? Do they ever use voluntary fasting? At what time do they rise — their Baths? What is the diet — manner of cooking & times of eating among the Indians? How do they preserve their food? Clark utilized Rush’s list and added a few of his own queries concerning the treatment of smallpox and methods of inducing evacuation. Questions relative to morals appeared on Rush’s and Clark’s lists and revolved around vices, suicide, murder, liquor, and punishment for offenses. Lewis and Clark on the Lower Columbia by Charles Marion Russell. Wikimedia. Indian health practices were worthy of the Lewis and Clark Expedition’s notice as in some ways they were equal to or more advanced than those of the white settlers. Similar to the white man’s medicine of the time, the Indians relied on experience and observation rather than strict scientific experiments. The Native Americans practiced bloodletting and purging, induced sweating and vomiting, and mingled their medicine with mysticism and ritual. They treated constipation with herbs, and gave enemas by utilizing horns and animal bladders. Indians chewed certain roots, made decoctions, and administered drugs in teas or by inhaling fumes. They had a good understanding of sweating, emesis, menstruation, and childbirth. Plants were used to encourage abortion, speed delivery, or prevent pregnancy. Sacagawea was given several rattles of a rattlesnake to consume to hasten the birth of her son. Lewis observed that she gave birth within ten minutes of taking the rattles, but was unconvinced of their efficacy. The American Indians handled their wounds, empyemas, fractures and dislocations as well, if not better, than the 18th century white physicians. Their method of removing a retained placenta preceded Crede by a hundred years. The Indians definitely added 59 drugs to our modern pharmacopeia. Drugs used by the Indians and unknown in Europe include cocaine, quinine, ipecac, and witch hazel. Some plants increased palatability, but had no medicinal value, such as sassafras. with a vessel of water which he sprinkles on the bottom and sides of the hole and by that means creates as much steam or vapor as he could possibly bear, in this situation he was kept about 20 minutes after which he was taken out and suddenly plunged in cold water twise and was then immediately returned to the sweat hole where he was continued three quarters of an hour longer then taken out covered up in several blankets and suffered to cool gradually. This experiment was made yesterday; Bratton feels himself much better and is walking about today and says he is nearly free from pain. Several weeks later the medical report on Bratton remained positive. He no longer was considered an invalid and eventually served in the War of 1812.